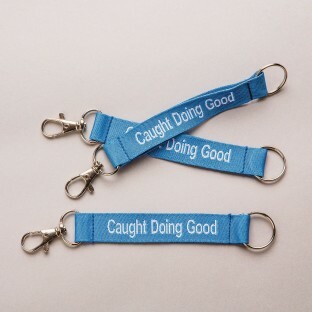 Handy lanyard key chains make a perfect incentive or prize for any age and a fun way to reward good deeds. Lanyard is 5"L x 3/4"W. Thumb hook and key ring fitting. Logo on both sides. I use these to promote good choices by our 9th and 10th grade students! They get caught doing good and have a choice between the lanyard and the silicone bracelet. The kids love them for their keys or hang them on their backpacks for all to see. They have a look of pride when they are presented with them. Positive reinforcement!! Awesome!